The New England Journal of Medicine, frequently referenced as NEJM, has a long history and important place in the sphere of American medical practice. During the recent 200th anniversary celebration, a special issue highlighted the changes in the challenges that patients and medical practitioners have faced over the centuries. Some threats, like smallpox, had completely been vanquished during this time thanks to vaccines. Other issues have changed in proportion, as so many of us live longer and our world has changed in remarkable ways. This piece, The Burden of Disease and the Changing Task of Medicine, offers a fascinating interactive graphic of the causes of death today versus those in the past. Access to new technology has certainly played a part in reducing the threats that used to plague us. Nobody calls for us to return to a time when diabetes killed children. Production of insulin by genetically modified bacteria has changed the course of this disease completely. And there is also hope that new technology and strategies can continue to prevent and reduce the impact of this condition going forward. Journals don’t simply disseminate new knowledge about medical theory and practice. They also define the scope of medical concerns and articulate norms for physicians’ professional and social roles. Simultaneously, they work to preserve their reputation, financial stability, and editorial independence in a constantly changing publishing environment, amid an avalanche of medical information. We will therefore suggest to our authors that they routinely acknowledge in a footnote all funding sources supporting their submitted work. Likewise, any relevant direct business associations should also be acknowledged, such as employment by a corporation that has a financial interest in the work being reported. Despite having clear policy guidelines in place, a recent opinion piece published in the NEJM by a physician and an economist focusing on the controversial issue of GMOs and pesticides escaped the proper scrutiny. The perspective piece, published on August 20, 2015 attempted to guide public policy but it failed to disclose the possible influencers or conflicts of interests of the authors. Attempts to address this with the journal’s editor, and inquiries to the ICMJE, were unsuccessful. The refusal to examine the evidence and to rectify this undermines the credibility of the journal and would be a perplexing precedent. “GMOs, Herbicides, and Public Health” by Philip J. Landrigan, M.D., and Charles Benbrook, Ph.D., asked for the FDA to alter its policy on genetically modified food labeling because of what they say are two significant new developments. First, there have been sharp increases in the amounts and numbers of chemical herbicides applied to GM crops, and still further increases—the largest in a generation—are scheduled to occur in the next few years. Second, the International Agency for Research on Cancer (IARC) has classified glyphosate, the herbicide most widely used on GM crops, as a “probable human carcinogen” and classified a second herbicide, 2,4-dichlorophenoxyacetic acid (2,4-D), as a “possible human carcinogen. Numerous researchers with experience in this arena have challenged the factual contentions in the article. That’s not the focus on this article; everyone has a right to express their opinion, and the authors are well known in their fields. My concern is disclosing potential conflicts of interest so the reader is fully informed about potential biases and can therefore better evaluate both the substance and context of the arguments. 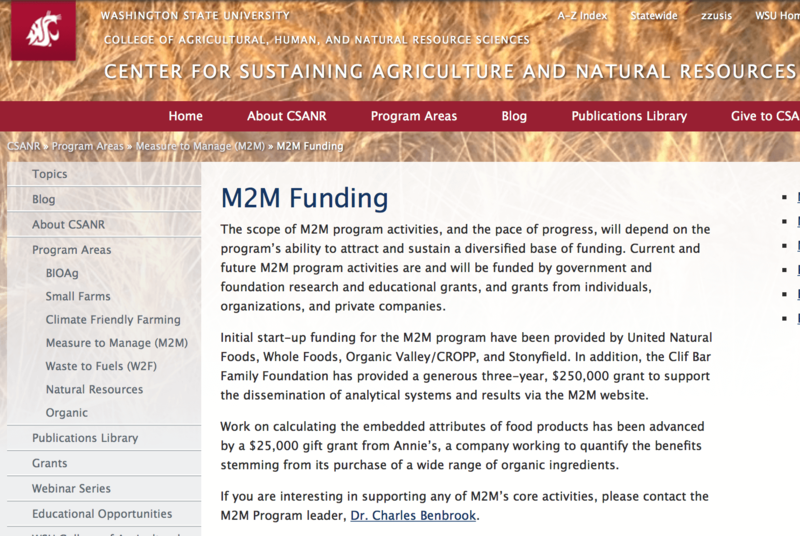 According to this document from the CSANR website — since removed by the university [but available here] — Benbrook’s entire salary and his M2M research program was funded by the organic industry with no funding support from any independent or university sources. But that was not the entirety of Benbrook’s conflicts of interest. Soon after the New York Times published additional evidence of undisclosed relationships of both authors. 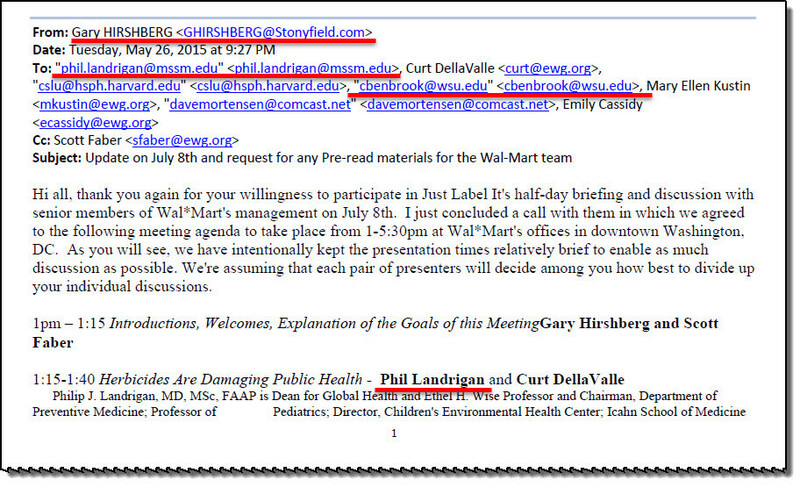 Reporter Eric Lipton used the Washington state Freedom of Information Act (FOIA) to obtain emails from Benbrook, which further demonstrate the close ties to the organic industry for both writers. Other emails obtained by a separate FOIA request reveal an even more elaborate web of influence and conflicts. FOIA’d documents show that Benbrook received more than $128,000 in 2013 from Washington University, with all the funding coming from industry sources. So it is not clear if Benbrook was still affiliated with WSU, as the NEJM article represents, when the opinion piece was initially submitted; but he was well aware that he was no longer at WSU during the evaluation process and before publication. There is no indication he took any action to correct what ended up being an erroneous claim of employment. Further, this document describes some other relationships relevant to this arena but not disclosed. Benbrook had run Benbrook Consulting Services for more than 20 years, serving on a board certifying “ecolabels” and another for non-GMO products, and acting as an advisor to Whole Foods Market — an outspoken critic of the use of glyphosate (Whole Foods includes glyphosate on its Prohibited and Restricted pesticide list). Benbrook also did not disclose his involvement with an eco-label certification organization and another business relationship that he maintained with Pesticide Data Central, selling data, advice, and services associated with this topic. If these boards and consultancies were pharmaceutical relationships linked to a researcher, certainly NEJM would find them valid conflicts. 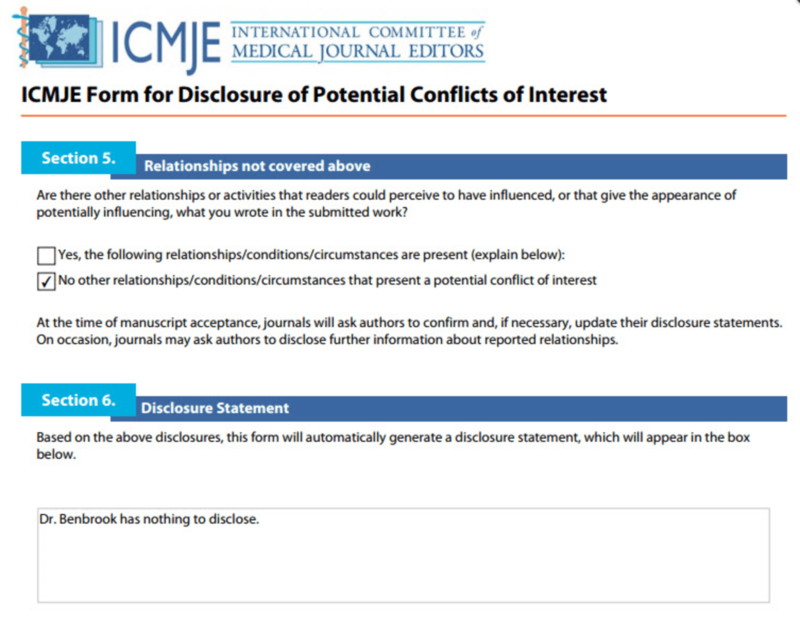 After the Times emails were posted, and after NEJM had been approached by numerous people, Benbrook did submit a revised answer to one question–whether he had any relationships or activities that readers could perceive as a conflict. The only additional disclosures: he was a member of a USDA crop biotech advisory committee and was a Principal in Benbrook consulting. He did not disclose the two clients most relevant to his opinion: Whole Foods, which has an anti-glyphosate policy and the Pesticide Data Center. In fact there is no acknowledgement of any of his extensive connections to the organic industry. As Benbrook’s CV on display at the Pesticide Data Center, Benbrook is also a consultant to the Organic Center, a research and lobbying arm of the Organic Trade Association — a direct and unmentioned conflict. When the NEJM editorial team was approached with this evidence, Steven Morrissey PhD, managing editor of NEJM, declined to evaluate this public evidence. 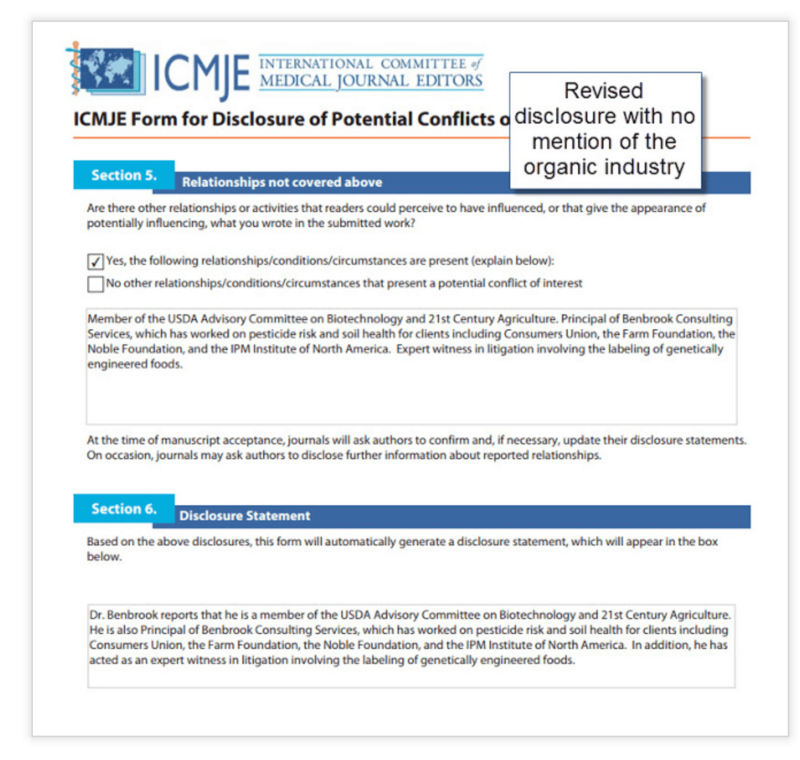 ICMJE responded that they “do not, however, have any ability to investigate or authority over its use by or the practices of other journals”, so paths for how to address this with normal channels remain unclear. What if researchers and physicians associated with a statin drug were taking trips to Washington with a lobbying group, and attempting to influence major pharmacy chains’ purchasing policies and FDA treatment recommendation? Would we expect this to be disclosed by authors in the NEJM? Of course. The science should still be evaluated on its merits, but disclosure of the relationship would be required. This situation is no different. Here Landrigan and Benbrook failed to disclose their relationships. And NEJM should insist on corrections to their disclosure forms, so that physicians, journalists, and general public readers understand this influence. If the editors of the prestigious New England Journal of Medicine intends to be a credible voice among the noise of nonsense on many medical and public policy issues, they need to adhere to the principles of scientific evidence and disclosure on all fronts. It’s difficult enough to find credible information in these days of dubious scientific publishers and free-range social media. Undermining the confidence in reputable scientific publications could only make things worse. …My interest in this issue is science. I have no financial interests [in] ag biotech or the pesticide industry. I have never worked for any of the players, nor have I received even a dime from them for any reason. Industry has never paid for my travel to lobby in DC, as Benbrook has. They have never paid any of my salary, as Benbrook. I have never received any food industry grants, as Benbrook. I am not on any boards, especially of organizations associated with labeling, as Benbrook. I have never received $120,000 and media training for manipulating the press, as Benbrook. I have no consulting or expert witness gigs, as Benbrook. I have no stock in any of the players, unless they are in the index funds that I have in my retirement account, but I don’t know what stocks they hold, I never look, I just buy and hold the indexes sometimes in my retirement accounts. I have no books or videos to peddle, like GMO haters. I have no affiliate marketing, like FoodBabe. I make no money from activism from any source, like Just Label It, or any other.